Please click on the image for a PDF of the article. 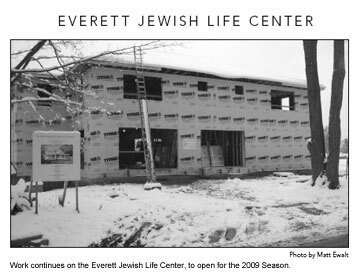 Last summer saw the dedication of the newly built Everett Jewish Life Center that houses meeting space for programming and community events, a library, an industrial-sized kosher kitchen and hotel-like overnight accommodations. Excitement is building at the Everett Center in anticipation of a wonderful second season. The programs planned thus far are numerous and eclectic. Our own Jewish Film Festival will be held throughout the summer with screenings and discussions held on a weekly basis. Brown bag lunches, book reviews and an array of wonderful speakers are scheduled. Dr. Deborah Lipstadt, American historian and author of the book "Denying the Holocaust" will speak during the first week of the season. Additional speakers confirmed for this summer include Dr. Adam Chalom, Dean for North America of the International Institute for Secular Humanistic Judaism, Rabbi Steve Gutow, Executive Director of the Jewish Council for Public Affairs and Menachem Daum, director, producer and screenwriter, whose film, "Hiding and Seeking: Faith and Tolerance after the Holocaust" has won world wide acclaim. Dr. Andrew Bostom, author of "The Legacy of Jihad" will share his insights and information about Islam and Judaism with us and Dr. Leonard Cole, Professor of Political Science at Rutgers University and an expert on bioterrorism will be with us during Week 9. These are just a few of the highlighted speakers and programs planned for the upcoming season. There is much more to follow, with additional speakers and a special multi-week exhibit and presentation from the Maltz Museum of Jewish Heritage in Cleveland now in the final planning stages. Nobel Laureate, writer, political activist and professor Elie Wiesel visits the Everett Jewish Life Center, July 27, 2009. 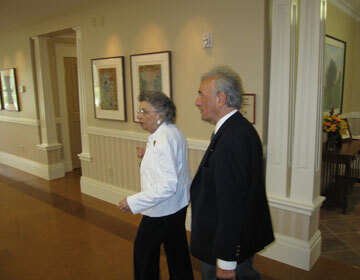 Coincident with his presentation and visit to Chautauqua, Wiesel is shown touring the new Everett Jewish Life Center in Chautauqua with Board President Edith Everett. Musicians played traditional Jewish songs as a crowd of people filed into their seats and filled the street in front of the new Everett Jewish Life Center in Chautauqua on Sunday. The day marked the center's dedication and official opening. Click to go to The Chautauquan Daily archive page and download the PDF. A painting of an olive tree welcomes everyone to the new Everett Jewish Life Center. At this newest of Chautauqua's denominational houses - inspired and gifted by Edith Everett and her family - Jewish Chautauquans are already calling the place "home." On July 5, Chautauqua, a 19th-century Protestant-founded village in western New York, will welcome its first official Jewish community center. Click to read the PDF of the article. The new Everett Center was funded through a lead gift from Edith Everett, a long-time Chautauquan, and her family in memory of her husband, Henry Everett, and with private donations from the broader community. 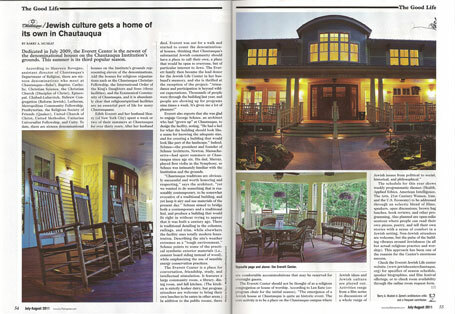 Read the rest of the article on page 10. Click to read the PDF of the newspaper. 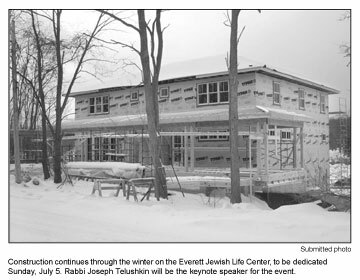 Life Center in Chautauqua by presenting a Jewish scholar of extraordinary renown, Rabbi Joseph Telushkin, author of the past two decades' most widely selling book on Judaism, Jewish Literacy, the Most Important Things to Know about the Jewish Religion, Its People, and Its History. The week's theme will be "The Jewish Way of Being." We are very pleased to announce that our Host Couple has been hired for the 2009 Season. They are Marcia and Jerry Pops who have been coming to Chautauqua for over 30 years and are very familiar with the Denominational House program having stayed in several over the years. Jerry has been a professor at West Virginia University since the mid seventies, holds a degree in law and teaches public administration. He has also lectured in the Hall of Philosophy several times. Marcia is a retired probation officer with years of volunteer service to the community. We look forward to a most wonderful relationship with them. 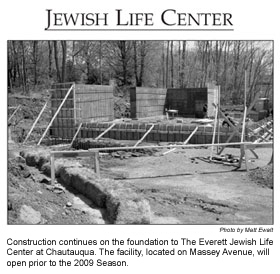 July 9, 2007 At 12:15 p.m. today, immediately following the morning lecture, the Jewish community of Chautauqua will break ground on the Everett Jewish Life Center. It will be at the site of the future building, the lot on Massey between Cookman and Peck, next to the Oliver Archives. Funding for the center is a gift of Edith Everett and her family. Edith and her late husband, Henry, have enjoyed time at Chautauqua for almost 30 years, and she remains a dedicated Chautauquan. The center is expected to be open for the 2008 summer season. It will be a Jewish House that will have a kosher kitchen, a library and provide a variety of programs. It is our hope that the non-Jewish Chautauqua community will participate in some of the Jewish House offerings, she said. Since there is a significant Jewish population that comes to Chautauqua and they come from all kinds of backgrounds, we thought it would be a good place to get together, to feel comfortable in a Jewish environment, she said. The Hebrew Congregation has been serving the Jewish community for a long time, and we appreciate what they do, Everett added. But some Jews aren't necessarily synagogue- goers. This will be an additional place for the Jewish community, secular or observant, to gather. The idea is that it will welcome the entire spectrum of Jewish people in the community as well as visitors. The public is welcome and encouraged to join the Everett family and Chautauquas Jewish community at the groundbreaking today.